Rooted in tradition, these handles have a freckled appearance with elegant tones of light tan to darker reddish brown in the gray. Features include: Tru-Sharp surgical steel blades, gray sycamore wood handles, brass pins and liners, nickel silver bolsters and oval shield, and 3-3/8″ Clip point and spey blades. Blade width: 5/8″, 1/2″ Blade thickness: 1/16″ Closed Length: 4-1/4″ Made in the USA. 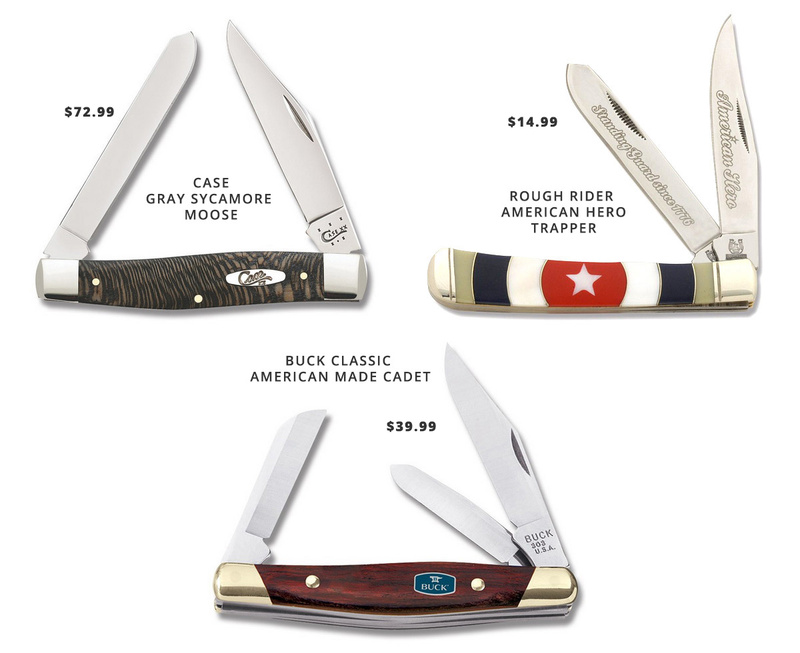 Case is well-known for its American-made traditional pocketknives. You can’t go wrong with a Case knife, and this one is sporting a very different and very gorgeous handle material. I’ve added two of these to my personal collection. Another classic American brand, that now does have some offerings from overseas. 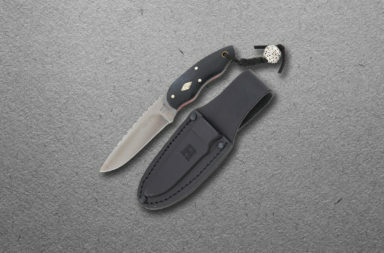 This American-made Cadet’s features include: 420HC stainless steel blades, rosewood dymondwood handles, brass pins, liners and bolsters, color-filled Buck shield, 1-1/2″ Sheepsfoot and spey blades, as well as a 2-1/8″ Drop point blade. Blade widths: 5/16″, 5/16″, 9/16″ Blade thicknesses: 1/16″ Closed Length: 3-1/4″ Made in the USA. Buck isn’t as well known for it’s pocketknives these days, but I like the rosewood and brass on this little cadet. It’s a gorgeous little knife. Rough Rider is known for its high-quality materials and craftsmanship at a price point that will not break the bank. 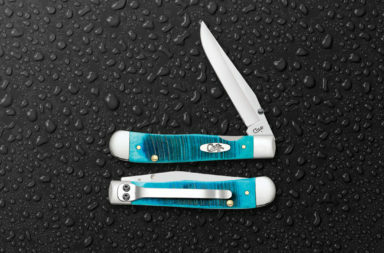 Rough Rider celebrates the American Her0 with this new line of trapper pattern. Its features include: Embellished 440A stainless steel blades, synthetic, curved inlay handles (with accents of genuine mother of pearl), brass liners, nickel silver bolsters and spacers, a 3-1/8″ clip blade, and a 3-1/8″ spey blade. Blade widths:1/2″ Blade thickness: 1/16″ Closed Length: 4-1/8″ Made in China. The price point is unreal for the craftsmanship of this Trapper. The inlay is hand-placed on every handle and just gorgeously done. And, I really dig the old War War I homage in this handle. This is a fun little everyday carry. While Colt is best-known for its firearms, they’ve been producing some quality tactical folders and pocketknives with their overseas partners. This X-1 is among them, and its features include: Stonewashed finish 440A stainless steel, modern tanto blade, blood groove, black G-10 handles, removable and reversible pocket clip, thumbstud, and a 3-1/4″ blade. Blade Thickness: 1/8″ Blade Width: 1-1/4″ Closed Length: 4-9/16″ Made in China. The action on this tanto is nice and easy for one-hand-opening, and the price and quality cannot be beaten. 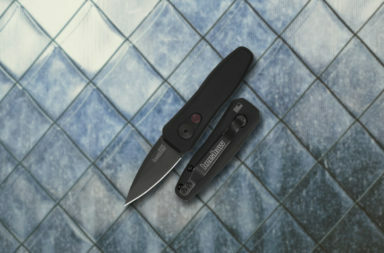 The Kershaw Cryo II goes tactical with a BlackWash finish. 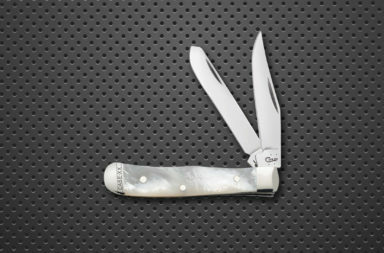 Designed by Rick Hinderer, this classic design was built for those who just demand more from their pocketknife. It’s built of pure stainless steel, coated with a BlackWash titanium carbo-nitride for a no-fuss look that also helps hide any additional scratches you may put on the knife during use. Like all Rick’s knives, the Cryo II benefits from his real world experience as a firefighter and EMT. Its designed to be a sturdy knife that’s still visually pleasing and feels good in the hand. For secure blade lock up, the Cryo II offers a tough frame lock with lockbar stabilization. The Cryo II also comes with Kershaw’s SpeedSafe assisted opening for fast and easy one-handed opening. Access it with either the built-in flipper or the thumbstud. Though it’s a larger knife, the Cryo II is remarkably slim and rides comfortably deep in the pocket, thanks to the pocket clip. It’s features include: 8Cr13MoV stainless steel blade, 410 stainless steel handles with jimping BlackWash titanium carbo-nitride coating, ambidextrous thumbstud, blade flipper, SpeedSafe assisted opening, quad-carry, deep carry pocket clip, lanyard hole, and a 3-1/4″ Blade. Blade Thickness: 1/8″ Blade Width: 1-1/4″ Closed Length: 4-3/8″ Made in China. SOG is known for its innovations in the knife world. The SOG Zoom is designed to tackle any emergency situation and is ready to go at a moment’s notice! Its features include: AUS-8 black coated, stainless steel blade, thumb ridges, ambidextrous thumbstud, hard anodized alumimun handles, one-handed SOG assisted opening, safety lock on handle, reversible low-carry pocket clip, lanyard hole, and a 3-1/2″ drop point blade. Blade width: 1-1/16″ Blade thickness: 1/8″ Closed Length: 4-3/4″ Overall Length: 8-1/4″ Made in Taiwan. Again, the popular firearms company has teamed with partners to develop some really fantastic tactical and pocketknives. This custom design was created for Colt by long-time designer, Andy Armstrong. 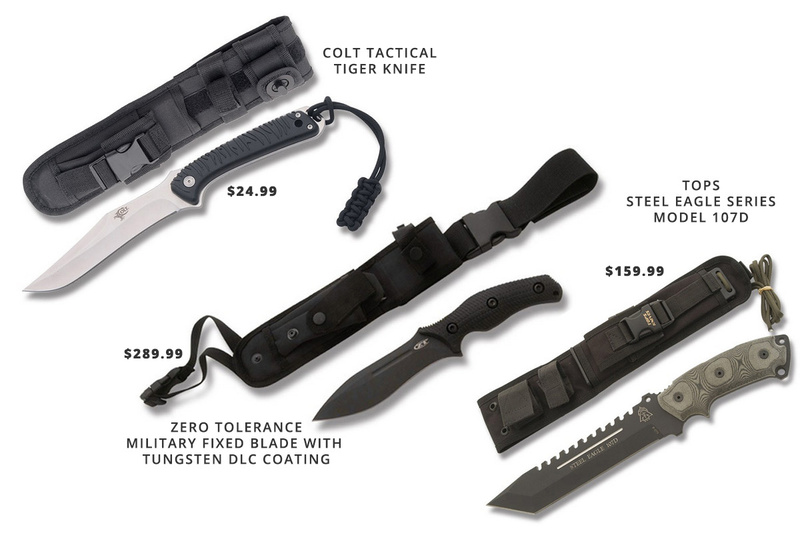 Compare this fierce “tiger” to other tactical knife brands that sell for three times the price! Its features include: 8Cr13Mov stainless steel blade, Zytel handle with tiger stripe grooves, lanyard hole with paracord, fire starter, and a full 6″ long-drop, clip point blade. Blade Thickness: 3/16″ Blade Width: 1-1/4″ Overall Length: 11-5/8″ It comes with a MOLLE compatible nylon sheath with multiple carry options and utility pockets with survival gear (contents may vary). Made in China. Zero Tolerance is known for creating high-end tactical knives by partnering with well-known names in the knife industry. This military fixed blade was designed by Ken Onion. The unique blade style is designed for multi-tasking, minimal mass, and maximum performance. It offers ideal leverage for tough cutting situations and a precisely centered point for piercing tasks. Its features include: CPM3V tool steel construction, black tungsten DLC coating, full tang construction, 3-D machined G-10 handle scales, heavy-duty steel rivets, lanyard hole, and a 6″ drop point blade. Blade width: 1-1/2″ Blade thickness: 3/16″ Overall Length: 10-1/2″ It includes a ballistic nylon belt sheath and is made in USA. Check back for more of Pete’s Picks.